The ChargePoint CT4023-GW1 Gateway Unit commercial electric vehicle charging station (EVSE) is the right fit for any business to offer convenient, fast, safe and reliable electric car charging to employees, customers and residents. 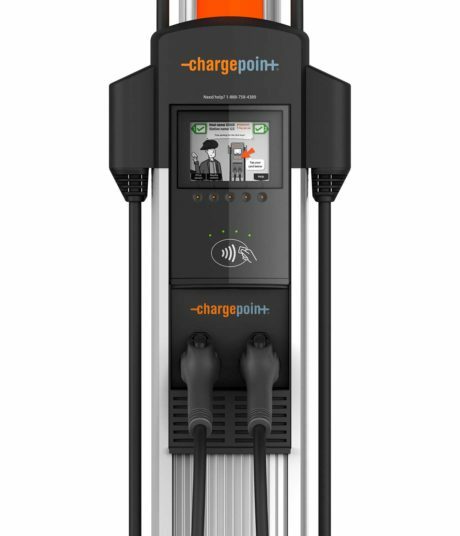 The ChargePoint CT4000 series generates revenue, branding and sustainability opportunities while charging popular electric car models including Tesla, Nissan LEAF, BMW i3, Chevrolet VOLT, Ford Fusion Energi and more. Retain high value employees, customers and residents by keeping them charged up and coming back. The ChargePoint CT4023-GW1 Gateway Unit shares attributes of the renowned ChargePoint CT4000 series – branding opportunities, access to a national network of customers, fast delivery of 7.2kW of AC power, retractable cable design, weatherproof reliability and over-the-air software updates. This unit is a dual port, wall mount unit with an 18 foot cable. See the full ChargePoint CT4000 commercial electric vehicle charger series for numerous feature configurations. The ChargePoint CT4023-GW1 Gateway Unit connects to the ChargePoint network and either functions on its own or acts as a master control for your local installation group of charging stations. Up to 9 Non-Gateway ChargePoint CT4000 series charging stations can be paired to one Gateway Unit.